The Colorado Ski Country USA Annual Meeting is the premier conference for Colorado ski industry professionals. The Annual Meeting delivers news, education, tools, strategy and networking opportunities during a full day of programming. 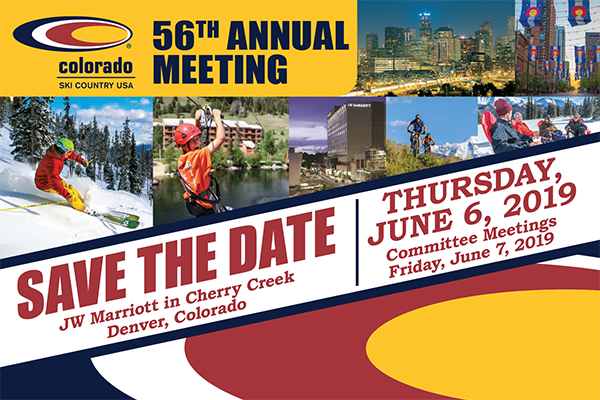 On June 6, the 2019 Annual Meeting will bring together leaders in Colorado's ski industry, experts in related and relevant fields, and other affiliated business professionals. Programming will feature speakers, breakout sessions and open dialogue to inform and educate attendees about the future of Colorado's ski industry. CSCUSA members and non-members are invited to join ski industry representatives as we review the 2018-19 ski season and look ahead to 2019-20 and beyond. Registration costs & information, guest speakers & event schedules, hotel & travel information and details about the Double Diamond Awards can be found throughout this website. More schedule details will be added as they become available. Speaker information to be announced later. Interested in sponsoring the 2019 Annual Meeting? Please contact Chris Linsmayer at clinsmayer@coloradoski.com. Questions: contact Chris Linsmayer at clinsmayer@coloradoski.com or 303-837-0793.